I tend to either be super organized or super unorganized. There really isn't any in between for me. Now that I'm attempting strength training on my own and setting up my own workout plans, I need to focus on being super organized. Otherwise, it just isn't going to happen. 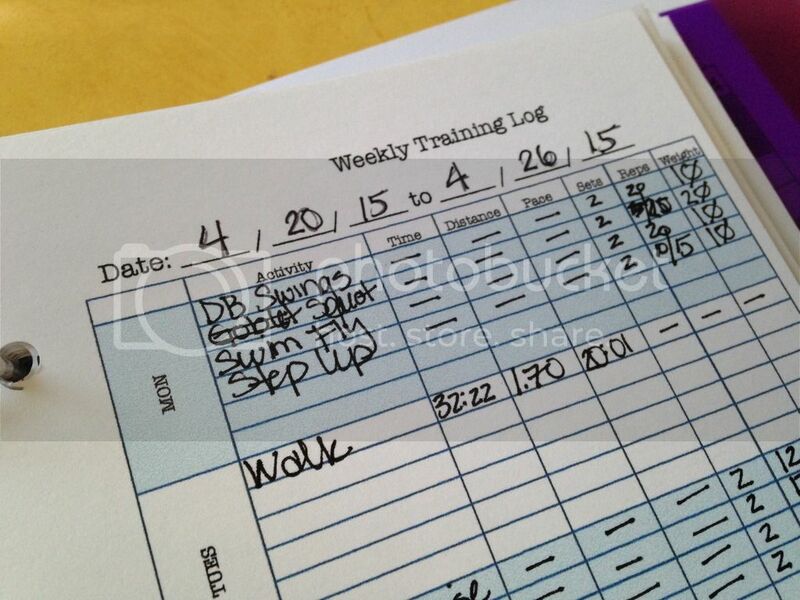 I've even starting putting my workouts on my calendar like I did when I was working with a trainer. Thus far, things have been going o.k. but as always, it is a work in progress. 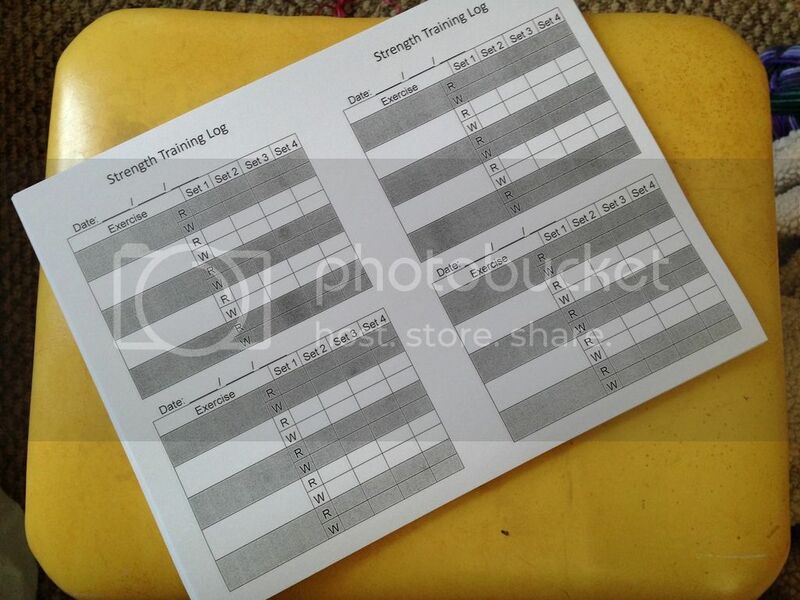 To help move things along in the right direction, I wanted a training log to keep everything together, not only to track my progress but also to plan my workouts. If I have everything planned out and I don't have to think too much about it, then I won't bail on the scheduled workout (unless it ends up being a day like Tuesday where I worked 11 hours, spending all of that time running around like a chicken with my head cutoff). The only problem was, I couldn't find one I liked. I'm kind of obnoxiously picky when it comes to journals, notebooks, planners, etc. and none of the training logs I found online had what I wanted. Just a simple layout where I could track my runs, plan out my strength training workouts and maybe have mileage or race training plan section. Ideally, it wouldn't be dated and I could add and remove pages as needed. Since what I wanted didn't exist in nature, I decided to make my own. First I needed the actual log. I found some on Etsy and Pinterest that were a good place to start, but I didn't need something with a fancy design or graphics. And I also didn't need anything that tracked food, weight or how much water I was drinking. After I figured out what I wanted to track (exercise, mileage, pace, reps, weight and how many sets), I put together a super 2 simple logs in Excel. The first was to track things each week. It's has space to track what I did that day i.e. run, ride the bike, yoga, strength train, etc. And also space to track my time, distance and pace. 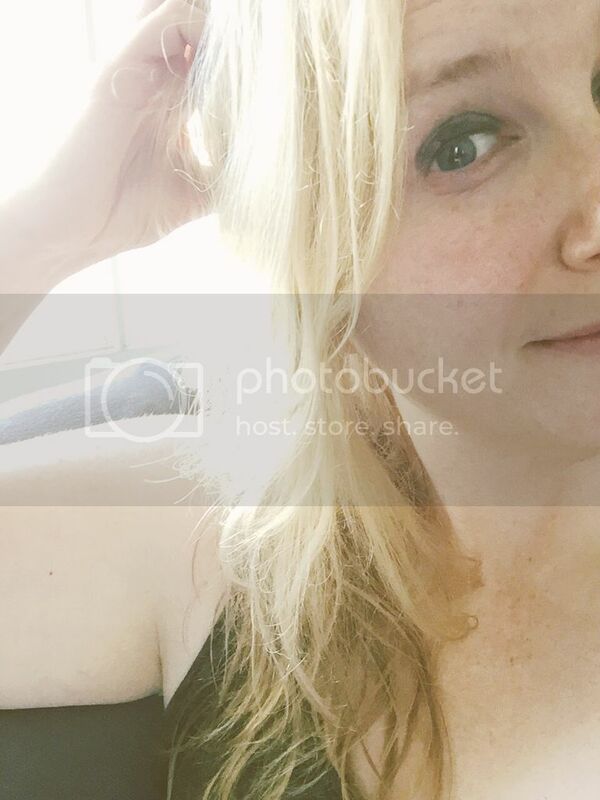 Initially, I had planned on tracking everything here, but as I started actually planning out the workouts, I realized I needed something that would focus on putting together strength training plans as well. So I made a second log which is just for strength training. 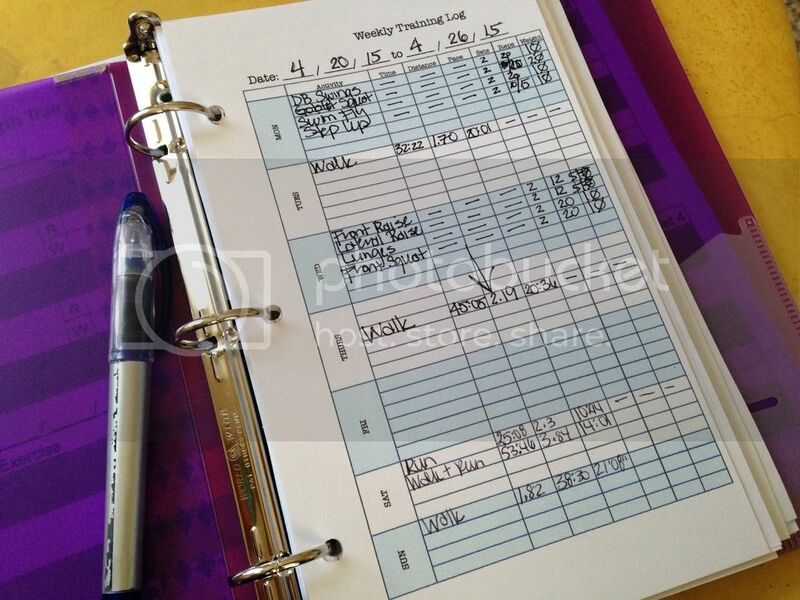 Having the individual daily logs has been GREAT because I can write out four or five of them at a time and just plunk them in to my training program as needed. Once I had the log all worked out, I needed something to keep it in. I took myself to the local discount store (this place is AWESOME, it's literally a giant pole barn full of random stuff and if you see something you might want to buy, you just buy it because it will not be there the next day) to see if they had something that might give me something to work with. Because I wanted to add and remove pages as I went along, I knew I wanted my log to be in a binder. I just didn't want to have full sized one because it would take up too much space in my gym bag. And honestly, who wants to haul around a giant binder all the time? As luck would have it, they had EXACTLY what I was looking for. 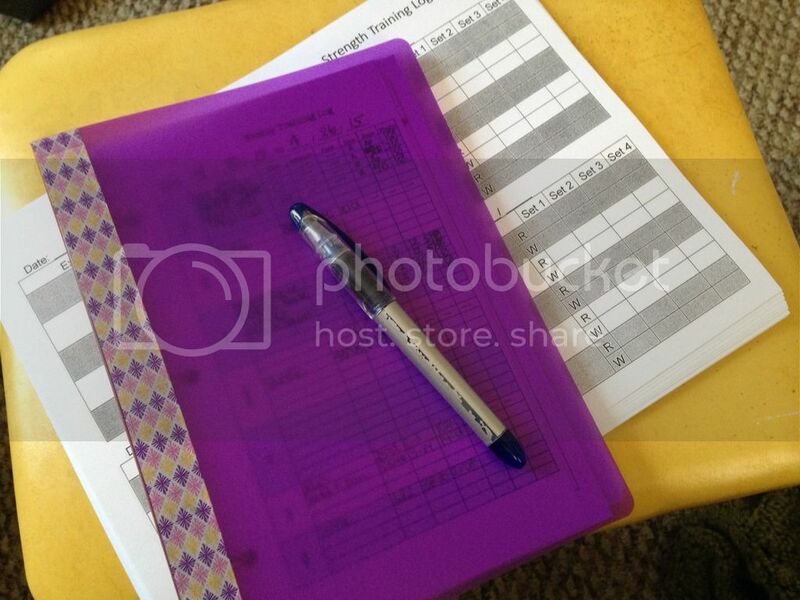 A small, three-ring binder to keep everything together it only cost $1.99! You just can't beat that price. I've also added pages in the back to track just my mileage (one of my 2015 goals is to log between 500-750 miles) and also a training log for when I actually sign myself up for a race. It's been awesome using my new log to track everything. All of my runs (and walks) are in one place. And when it comes to strength training, I just have to flip through the various plans I have and I am good to go! Here is to hoping it continues to make my workouts less "stressful" and keeps me on the right track!